1. Expose for the non sunlit areas and let everything the shaft of light hits appear even brighter (it’ll be white, too bright for the camera to capture any detail but still a good effect for other pictures). 2. Expose for the sunlit area and use a flash to bring up detail in the shadows. 3. Expose for the sunlit area and let the shadow areas go dramatically dark as in this picture. 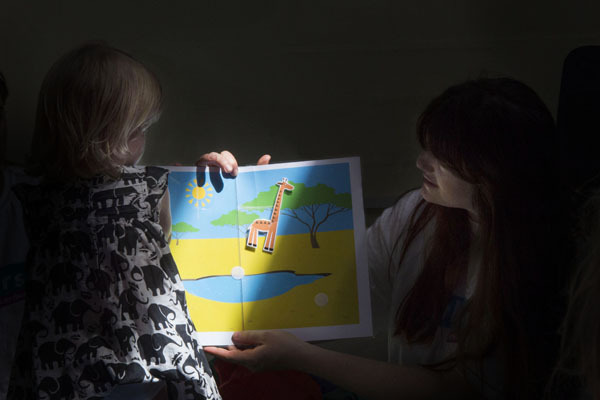 All of a sudden the book came into the light, illuminating the giraffe and watering hole scene in the story, splashing light onto the surrounding storyteller and a passing child and so capturing a tender moment between the adult and a young listener.